Bestselling author David Meerman Scott has included the Nikonians community in his newest book The New Rules of Marketing and PR. Scott's book describes the rapid evolution of marketing and public relations in the new world of online information sharing. In his book (published by John Wiley and Sons) Scott inludes a section entitled Your Best Customers Participate in Online Forums--So Should You. He cites Nikonians by name in that chapter as he describes the impact of online digital photography forums on the marketplace in general and a specific case in particular. B.J. Nicholls (BJNicholls) and George Barron (N80) are two of our community members quoted in the case study, which shows how one company representative quickly turned a potential negative public relations problem into a positive, by joining in on the conversation. 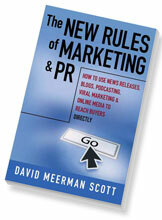 David Meerman Scott's blog site Web Ink Now provides links to many interesting marketing and public relations case studies and his complete line of audio seminars and published works.